GCA Altium acted as exclusive financial advisor to the founder and sole shareholder of BELViNi, a leading German wine eTailer, on the sale of a majority stake to Oetker, a global food and beverage group with more than EUR 6bn annual revenues. BELViNi is a leading German wine eTailer with a large premium wine assortment in stock. Over the last 15 years the Company has established long-standing relationships with 800 suppliers globally, which guarantee access to scarce and eligible premium wines in adequate amounts. In addition to its premium wine portfolio, BELViNi has established the most comprehensive online wine content platform in German-speaking Europe thanks to its in-house wine selection process conducted by BELViNi’s experts and its proprietary wine-specific software. BELViNi has shown strong growth in recent years and was looking for a partner that can facilitate its further expansion. Oetker is a leading global food and beverage group with more than 300 international companies. 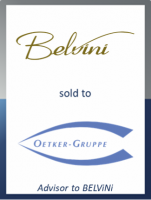 BELViNi will benefit from access to Oetker Group's companies, especially Henkell & Co. and Oetker Digital. Within the group’s “Sparkling Wine, Wine and Spirits” division, Henkell & Co. is the leading provider of sparkling wine, wine and spirits in Europe, which operates in 22 countries. Oetker Digital was founded in 2016 to actively supports the group's companies with digital expertise and capabilities. The founder and managing director of BELViNi will remain a shareholder and support the company in the future as part of BELViNi’s management team. The management team is excited to work alongside Oetker, who in their view is the ideal partner to shape BELViNi’s future growth based on its extensive experience in international food and beverage markets. Tobias Schultheiss, Managing Director at GCA Altium, said: "We are delighted to have advised the founder on this transaction. BELViNi and the Oetker Group have a strong strategic fit and we are convinced that BELViNi will continue its successful growth track-record to become one of the leading international wine eTailers." The transaction was signed on 4th October 2018. Terms of the transaction were not disclosed and closing of the transaction is subject to approval by the relevant antitrust authorities.